Talk about "Beam me up!" The latest entry in the "Star Trek" science fiction franchise — "Star Trek Beyond" — has been "beamed up" to the International Space Station for real-life space explorers to enjoy as they live and work in the final frontier. 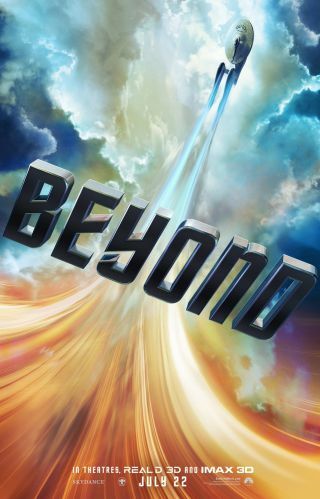 Representives with Paramount announced on Oct. 4 that "Star Trek Beyond" was sent to the space station crew. The timing coincided with World Space Week and the 59th anniversary of the first orbital launch of Sputnik 1 on Oct. 4, 1957. "Star Trek Beyond" hit theaters in July, just a few months ahead of the "Star Trek" franchise's 50th anniversary on Sept. 8. That milestone, which celebrated the anniversary of the original "Star Trek" TV series' debut was felt even all the way in space, with NASA launching an entire website to mark the occasion. Paramount representatives said "Star Trek" has been "widely credited for inspiring a number of technologies we enjoy today and for depicting a future in which international — and interspecies — coperation advances human knowledge beyond the bounds of Earth." For example, NASA's first space shuttle prototype was named the Enterprise after a successful campaign by dedicated Trek fans. And several astronauts (such as Michael Fincke and Terry Virts) have even made cameos in "Star Trek" episodes. "Star Trek Beyond's" space station trek comes as the film is available as a Digital HD download. The movie will be available on 4K Ultra HD, Blu-ray and DVD on Nov. 1.